The Ford-Peabody mansion in Birmingham is a stunning piece of Victorian architecture. Built in 1878 by businessman Frank Ford and designed by well-known Detroit architect Almon C. Varney, it was once used as Ford’s home, then his daughter’s (who was married to J. Bert Peabody), it later became a masonic lodge, and eventually was used for several businesses. Now, the historic space can add restaurant to the mix. Since Adachi opened its doors last August, the newly popular restaurant has garnered rave reviews from those drawn to a casual, yet sophisticated dining experience. Serving up Japanese-inspired cuisine by a James Beard award-winning chef, the Adachi experience is anchored by a menu teaming flavor, diversity, and a carefully curated homage to Japanese cuisine and culture that will leave you coming back to try the appealing menu items you may have missed upon your first visit. 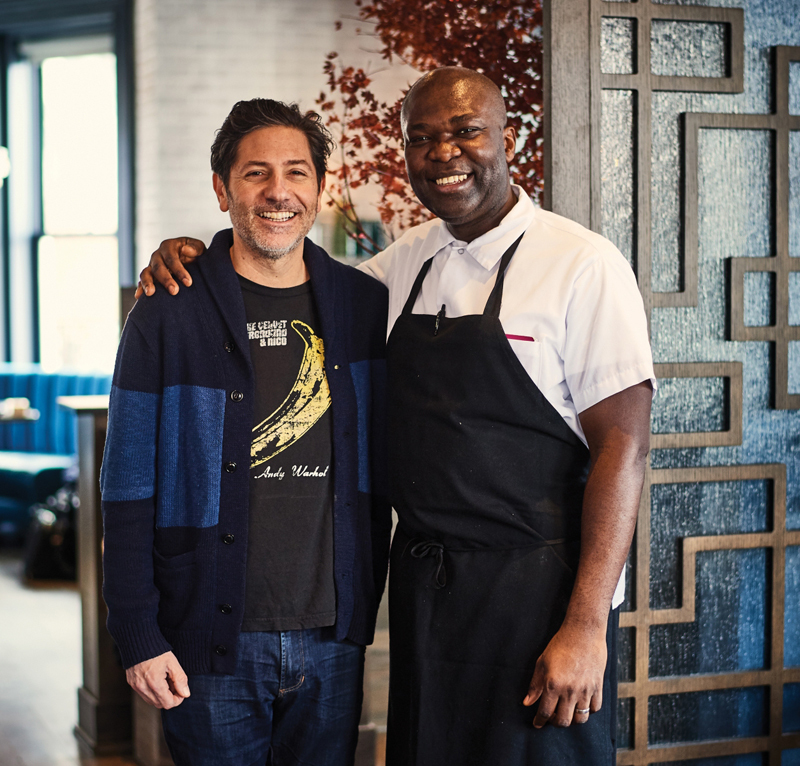 The catalyst behind Adachi is Boston-based chef and restaurateur Michael Schlow, also responsible for the multi-location Alta Strada, The Riggsby in Washington, D.C., West Hollywood’s Cavatina, and Boston’s beloved Radius, whose famous burgers and 15-year run came to an end in 2013. Yuzu, a staple at Adachi, shines in Lobster Tacos, Crispy Chicken, and a Yuzu Truffle Hamachi Roll. 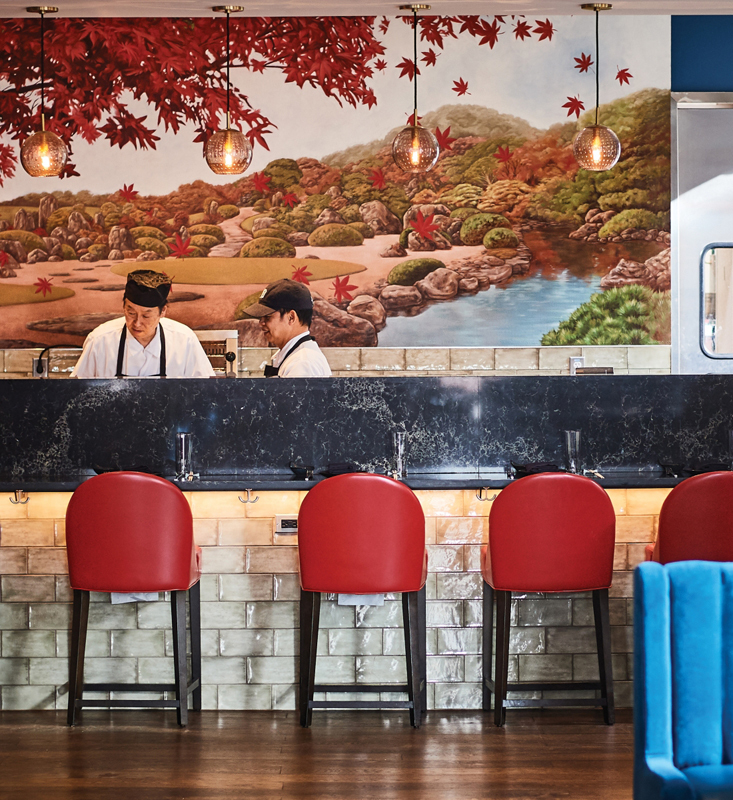 Together, Schlow and Roberts have developed a menu at Adachi that is a well-executed nod to many of the wonders of Japanese gastronomica while also flexible enough to explore flavors and ingredients beyond those limits. 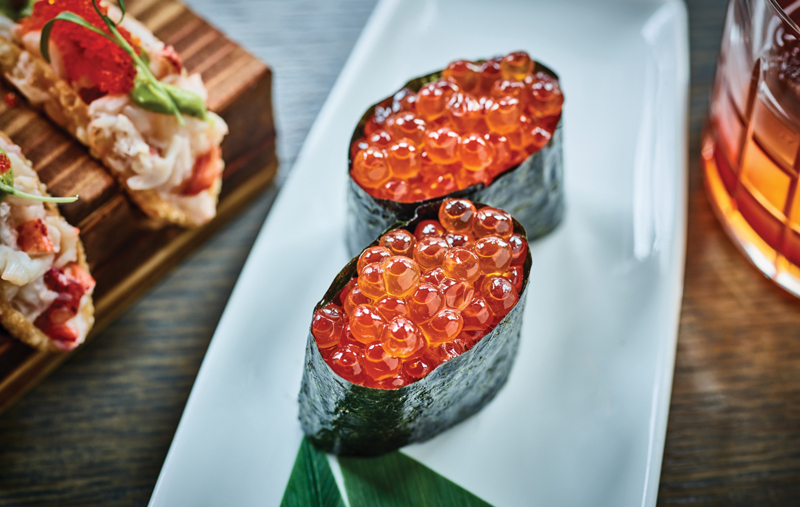 The restaurant’s sushi offerings include Ikura (salmon caviar) and Unagi (freshwater eel), as well as a Yuzu Truffle Hamachi roll, featuring the Japanese amberjack, which is native to the northwest Pacific Ocean. Adachi’s vegetarian options on the menu taste just as tempting as they appear on the plate — a mushroom with lime and truffle salt and a cucumber with sesame and furikake, an authentic dry Japanese seasoning, round out the list of sushi sans the fish. Beyond these offerings, the menu is divided into small and large plates, yakitori (think Japanese shish kabob) as well as salads and vegetables. It’s with the small and large plates that the restaurant’s ethos of “Japanese-inspired” comes into play, a term Schlow says gave him and his partners the creative freedom to bring other ingredients into the mix that might not be associated with Japanese cooking. 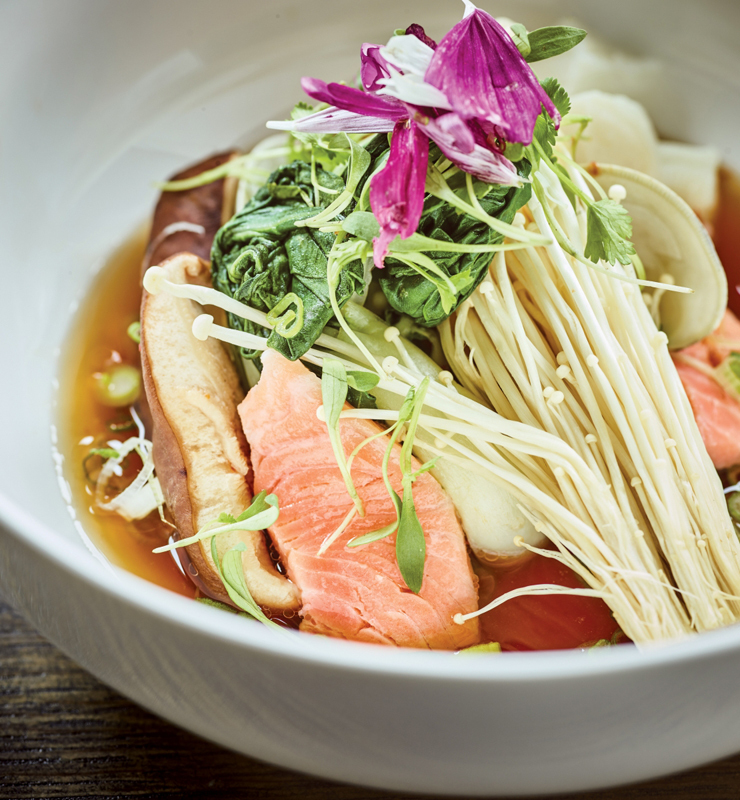 The Adachi experience is anchored by a menu teaming flavor, diversity, and a carefully curated homage to Japanese cuisine and culture. A good example is the lobster tacos. Made with yuzu, an aromatic Japanese citrus fruit, avocado, and tobiko (flying fish caviar that’s smaller than Ikura), they’re a visual masterpiece destined for greatness, both for your appetite and Instagram stardom. The heritage pork dumplings are in the style of an Italian pasta called cappalletti instead of gyoza, and are served in a soy truffle broth. A large plate of crispy chicken served with soy, ginger, and yuzu is a house favorite, its simplicity serving as a nice break between dinner and dessert, which includes a not-to-be-missed matcha swirled cheesecake accompanied by orange marmalade and a scoop of vanilla ice cream. Decorative murals pay homage to Japanese culture. An extensive drink menu features wine and sake. Craft cocktails also shine, including refreshing takes on familiar drinks such as the Japanese Whisky Sour and a Tokyo Martini. There are also subtle nods to Michigan with drinks like the Meiji Era, made with Nikka Coffey Grain whiskey and Michigan Cherries. The interior, designed exquisitely by D.C.-based Molly Allen, carries the same philosophy as the menu, combining original features of the Peabody mansion with Japanese touches, such as a tapestry hand-painted with pink cherry blossom trees that hangs on the ceiling and a stunning geisha mural, which acts as a backdrop to the sushi bar. After making his mark in Birmingham, Schlow says he has other projects he’s working on in the metro Detroit area. 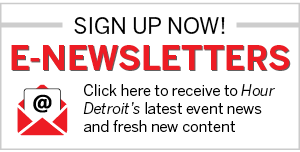 In West Bloomfield, he plans to open Zao June, a Pan-Asian restaurant, which will feature “the greatest hits of all the Asian cuisines we love in a time-honored, respectful way,” he says. Watch for Schlow to make his way to Detroit, too. He’s currently getting a feel for what he can bring to the core of the city. Adachi, 325 S. Old Woodward Ave., Birmingham; 248-540-5900; adachirestaurant.com. Mon. 11:30 a.m.-10 p.m., Weds. 11:30 a.m.-10 p.m., Thurs. and Fri. 11:30 a.m.-11 p.m., Sat. 5 p.m.-11 p.m., Sun. 5 p.m.-9 p.m.; Closed Tues.